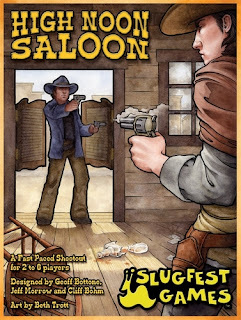 High Noon Saloon is a fast-paced shootout. Players are combatants in an all-out brawl fought in an old west saloon where the last one standin' wins and there ain't no prize for second! This is the perfect game on a Friday night to take out the frustrations of the week on up to five of your friends. Fill your fist with your weapon of choice. Make sure you have bullets. If not, grab whatever is handy, a Hunk o' Wood, a Chair, or even a Red Hot Fire Poker. Call 'em out from behind the bar or from the piano; jump off the upstairs balcony, thump them good and then hunker down for the next round. The first thing that you should know about Cardcassonne is that it does not play like Carcassonne. The game play is dramatically different. 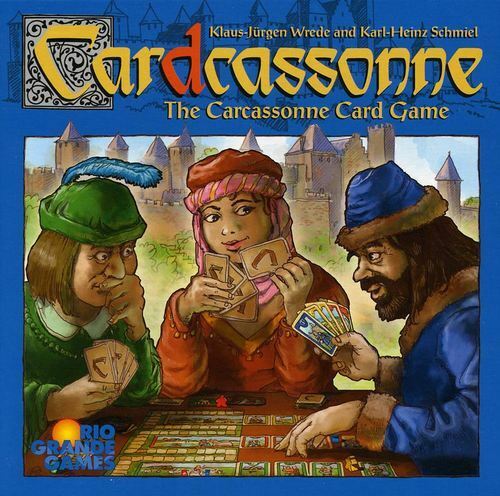 In Cardcassonne players create rows of cards in a central play area. The cards are a makeup of person cards, animal cards, and building cards. On your turn you can either continue to build on the rows or claim a row. However, you may only make one claim per round. There is a definite press your luck element as to when to claim your row. Rows can contain both face-up and face-down cards adding to the dilemma. Sets of Person cards are scored then discarded at the end each round. Sets of Animal cards are scored at the end of each round and held for future additions that increase in point value. Sets of Building cards are collected and scored at the end of the game. The player with the most points wins. Come in and try out High Noon Saloon and Cardcassonne. While you are here in the store we'll be happy to teach you the rules to the game and get you started.